The formation of Lincoln Aero Club is due to Tom Hayes. He was born in Lincoln and spent most of his working life in the area. In 1951, Tom had acquired a Taylorcraft G-AIRE which he flew from Boston as Lincoln had no flying club. Tom was able to find a field in Bardney, some six miles southeast of Lincoln, which was in relatively good condition compared to all of the other airfield that were either in a bad condition or restricted by the pre war bombs. Tom was able to approach the Ministry of Defence and get a course permission that would let him use the runways and control tower, for a rent of 25.00 per quarter year. A small working party set about getting the airfield into shape in the spring of 1956 and a committee was formed in July. When a small party was set to celebrate the repairing of the airfield it was decided to call the organisation Lincoln Aero Club. 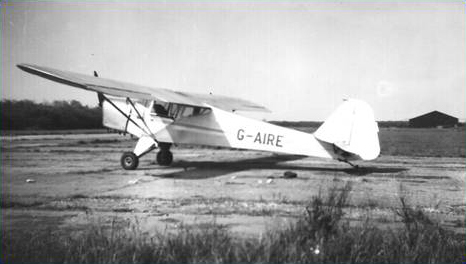 It would become a Popular Flying Association Group, (No 74) to enable it to operate the scheme whereby a number of people could share an aircraft and legally train on it without the machine having a commercial C of A, providing they were all owners and the instructor received no remuneration. An arrangement was made to use Toms Taylorcraft with part of everyones annual subscription counted towards their aircraft share. Flying hourly charges were set at two pounds, six shillings. Robin Simpson from Ancaster, an ex-RAF flying instructor, offered his services and flying instruction got underway in July. In the summer of 1957 a hangar was commenced. Progress was relatively slow as the substantial structure, sufficient to house three aircraft, was all made by the club members but by mid-1958 it just needed doors to complete. Unfortunately a letter was received on the 16 June from the MOD saying they were reoccupying the airfield (to use as a Thor missile site) and informing the Club that it had to vacate. So before the hangar was complete the Club had to take it down and empty the club house, which somehow they managed in the 28 days given. After more negotiation the Club was able to relocate to Kirton-in-Lindsey. The field was still in use by the RAF but after meeting with the station commander, he agreed, and hangarage and a building to use as a club house were also provided. The field was grass but well kept and suited the Taylorcraft. In 1959 a Tiger Moth G-AMEZ was purchased, which could be hired for three pounds per hour. The Club flourished and by 1960 the membership was over sixty strong, compared to eight or so that had started at Bardney. In 1961 the Club gained the use of a Turbi G-APFA which was owned by the PFA and loaned out to member groups. They were able to retain it for four months, whilst G-AIRE was away on maintenance. In the Spring of 1962 the Club acquired a further aeroplane, a Hawk Trainer G-ANWO. Unfortunately this aircraft had a short career as, following flying damage and a prohibitive C of A, it was permanently withdrawn from flying in April 1963. A Terrier G-ASKJ was purchased in September 1963 but the Tiger gradually lost popularity and was reportedly sold in 1964 for just 200, as members found it too cold! In 1963 the Committee decided that the Club should have a President and asked none other than Alex Henshaw, the famous air speed record holder and Spitfire test pilot. Alex was contacted and very graciously accepted the role, which he filled admirably. The Club stayed at Kirton until 1967 when Ministry requirements meant it had to move. There followed a difficult period at an unlicensed field at Blyborough Hall before the M.O.D allowed the Club to move to Hemswell in 1968 where it remained until 1975. There was the use of the control tower, a concrete runway which was still in excellent condition and one of the wartime hangars, which all added up to produce a strong club. It was a sad day when Hemswell was sold and the Club had to move once more, but it found an airfield with some promise at Sturgate. Lots of hard work and expense followed once more to repair the control tower and erect a hangar, but by the late seventies the Club was back on its feet with a more modern fleet consisting of a Cessna 150 and Beagle Pup plus several leased Condors and offering training for the PPL, Night Rating and IMC. The Club has remained at Sturgate since 1975, and after a hard start has become very well established. As well as refurbishing the control tower to turn it into a club house and weekend operations centre, the original blister hangar has been replaced by two large modern ones, housing some 20 aircraft. 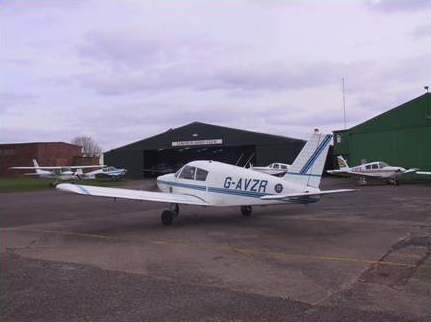 Sadly flying training had to discontinue in 2002 when the airfield became unlicensed, but club aircraft continue to be available with a Cessna 152 G-BONW, and a Cherokee180 G-AVZR. In 2014, the 152 was sold when members preferred the extra space in G-ZR but shortly after, ZR was written of in a takeoff accident, fortunately causing no serious injuries to its crew. After many months of searching, the Club's present aircraft, a Socata TB200, was purchased, and with its constant speed propeller members have a faster, roomier aircraft to enjoy. Find out how to join the club here!